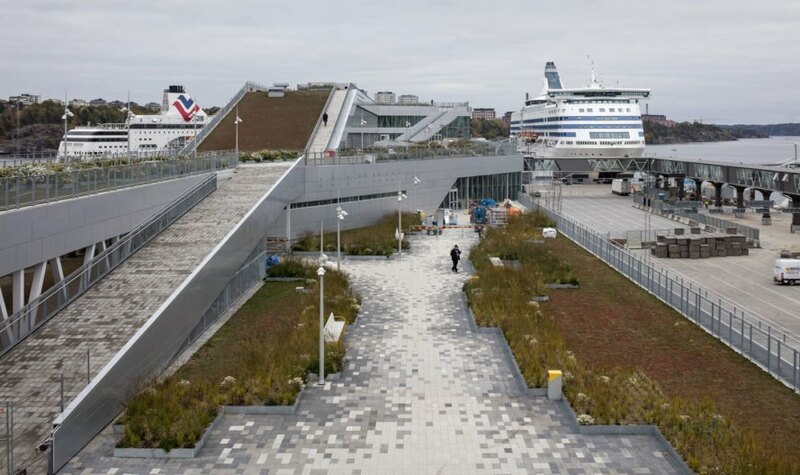 The recently completed ferry terminal in Stockholm is a cross between an urban park and a departing ship. Residents of Stockholm can use the roof of the terminal, designed by C.F. Møller, as a public park, which creates a fluid bridge between the city and the waterfront, the space between which is dominated by cranes and warehouses. The new terminal references the shapes of moving marine vessels and the surrounding area’s cranes and warehouses. It functions as a natural extension of the urban fabric. It slowly emerges from the ground to allow city inhabitants to use its roof as a public park. Varied green landscapes with stairs, ramps and niches create a beautiful environment where people can stroll and have relaxing moments while enjoying the view of the ferries, the archipelago, and the city skyline. The building is powered by solar and geothermal energy, distributed through integrated systems. Self-sufficient and aiming for a LEED Gold certification, the new terminal is expected to become both architecturally and environmentally a new landmark for the Norra Djursgårdsstaden development area. The new terminal references the shapes of moving marine vessels and the surrounding area's cranes and warehouses. It functions as a natural extension of the urban fabric. It slowly emerges from the ground to allow city inhabitants to use its roof as a public park. Varied green landscapes with stairs, ramps and niches create a beautiful environment where people can stroll and have relaxing moments while enjoying the view of the ferries, the archipelago, and the city skyline. The building is powered by solar and geothermal energy, distributed through integrated systems. 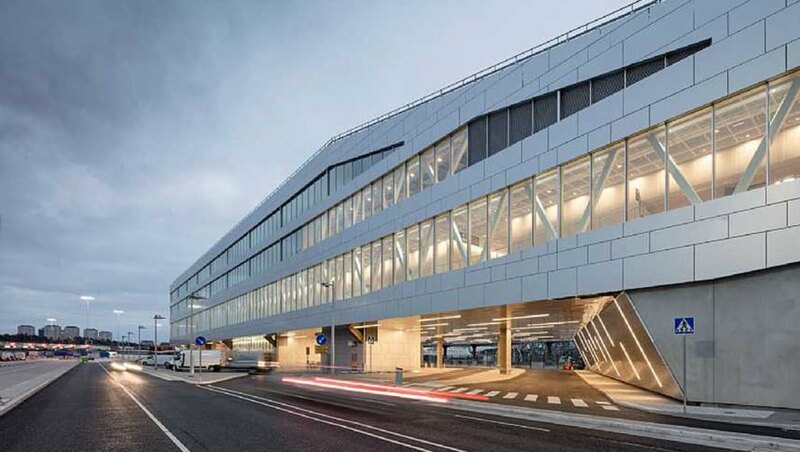 Self-sufficient and aiming for a LEED Gold certification, the new terminal is expected to become both architecturally and environmentally a new landmark for the Norra Djursgårdsstaden development area.